Reduce the time spent in the water and avoid loosing ground downwind by learning how to change direction using the sliding turn. It almost goes without saying that once you take to open water, one of the most useful maneuvers to master will be the ‘change of direction’. Once you head off you’re going to have to turn around at some point, so a great deal of time will be saved by not falling into the water and having to force yourself around. There is a much better way of doing it, and in this section, we’ll teach you the most common method to change your direction with style and without getting wet! Your frist transition - The Sliding Turn. 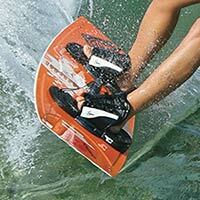 The slide turn is the easiest turn to master and is best performed with a twin-tip board. 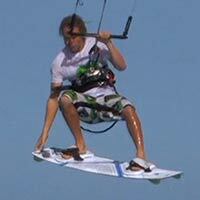 It’s also the turn people use the most, however good they are at kiting. Essentially, to perform this turn the rider slows to a stop before riding off in the new direction, but doing so using the lift and power of the kite to stop yourself falling backwards. Achieving this will require the coordination of your kite and board, but once it’s been mastered you’ll be rewarded by being able to stay upwind with much greater ease. Please confirm that you'd like Progression to email you when the new Changing Direction is available to purchase? You currently have an notification setup for the new Changing Direction and Progression will send you an email to let you know when it is available to purchase.